A client recently expressed frustration that although she does dozens of sit ups every night, she doesn’t feel like her core is any stronger. While sit ups are a good way to train your core, they actually aren’t the most effective or useful means for strengthening your ab muscles. We spend most of our time upright, either sitting or standing. That means we need to work our muscles in these positions. This is especially true for tennis. Your core plays a crucial role in stabilizing your body so you can make the shot. Here are some basic exercises that replicate motions you make in tennis. They’ll strengthen both your core and your game. 1.) Wood Chopper With medicine ball: Start with a low-weight ball (4-6 lbs) at first. Crouch down into a squat. Tuck your belly button into your spine, so you have a flat back. The ball should be touching the outside of your right foot. Swing the ball diagonally and up across your body until your arm is fully extended above your left shoulder. Bring the ball back to the starting position by reversing the motion. Move quickly and keep your core tucked in. Repeat 12 times on each side for up to 3 sets. When this becomes too easy, move to a heavier ball. The exercise is demonstrated here. 2.) One legged squats: These not only strengthen your core, but your glutes. Stand on one leg with the opposite leg off the ground and straight in front of you. 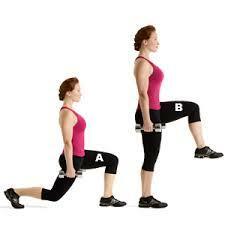 Squat back, keeping your core tucked in tight, your back flat and your knee over your ankle bone. Press back into the squat until your leg is parallel with the ground or to the point of tension. Come out of the squat by pushing up through your heel. Maintain your balance with a steady core and make sure your hips are even. It’s best to do this in front of a mirror so you can check your form. It should look like this. 3.) Lunge with knee lift: This is a great way to strengthen your core and legs. Start in a standing position. Step forward with one leg and bend your front knee, keeping it over your ankle bone. Your belly should be tucked in tight so there’s no sway in your lower back. Push your weight onto your front foot as you raise your back knee up and toward your belly button. Then step forward with the raised leg. Repeat for a count of 18. Rest and repeat. If these become too easy, add weight. The move is demonstrated here. Jennifer Aquino is a fitness instructor. When she’s not chasing balls on the court, she’s running people through drills to improve their stamina. She teaches a Conditioning for Runners class through the City of San Mateo. She blogs at Mothersontherun.com. This entry was posted in Uncategorized on August 27, 2013 by Jennifer Aquino.